The Matilija Coalition is a non-governmental organization comprised of local, state, and national organizations committed to the restoration of the Ventura River watershed through the removal of Matilija Dam. The Matilija Coalition has actively participated in the multiagency effort to remove Matilija Dam for the purpose of restoring the Ventura River ecosystem since the project’s inception. To date, the COE and County project managers have been unable to complete the final design of the Feasibility Plan that specified a slurry system to transport fine sediment downstream of water supply facilities to temporary storage areas near Baldwin Road. Attempts to alter the consensus Alternative Plan 4b to permanently store the fine sediment in a 70-acre landfill within a popular public recreation area understandably met with community resistance. Therefore, project managers are now considering another alternative which would permanently store the fine sediments upstream of the current dam site within Matilija Canyon. • Can a constructable alternative be developed to permanently sequester the fine sediments upstream of the dam so as to reduce impact to Lake Casitas? If so, what would be the environmental impacts and cost? The Matilija Coalition believes that the proposal to permanently sequester the fine sediments upstream of the dam in the manner described undermines the basic objectives of the Matilija Dam Ecosystem Restoration Project. Moreover, this will likely result in further delays to the project, which is already several years behind schedule. 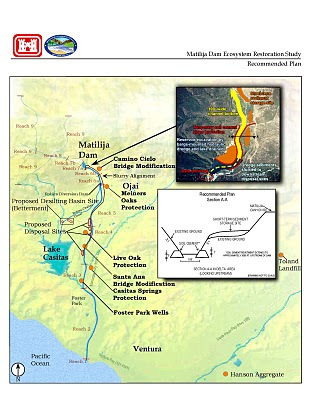 The upstream storage of fine sediments described by the COE will result in a permanent landfill and associated hardscape flood-control facilities within the high-energy floodplain of Matilija Creek: this proposal represents a significant departure from the consensus Alternative Plan 4b previously incorporated in the Feasibility Study and NEPA/CEQA environmental review, and raises significant concerns, including the environmental, procedural, and regulatory issues outlined below. Potential impacts to downstream infrastructure and water supply facilities. Need for ever-increasing flood-control armoring in order to maintain the flood protection structures in place. Cost to the VCWPD Zone 1 taxpayer to maintain the new flood protection structures in perpetuity. The location and extent of the USA fine sediment storage sites will reduce the active floodplain by raising the elevation of the sites above the level of flood flows, and by permanently armoring both banks of the channel in this reach. The permanent fill of the USA fine sediment sites will reduce the width of the active channel; this would alter the hydrology and hydraulics and increase the need for additional flood-control armoring hardening, both in the initial design of the pilot channel and following future high flow events. Channelization of the perennial stream section in the Matilija Reservoir area will reduce steelhead spawning and rearing habitat, reduce vegetative cover, and potentially reduce fish passage. The location and extent of the USA fine sediment storage sites will permanently bury riparian habitat and tributaries and springs, as well as the heritage oak grove identified in red with ‘Protect in Place’ in the 2004 Feasibility Plan. The USA fine sediment storage sites will reduce the area used in the HEP analysis to calculate the financial cost-benefit analysis. Reliance on permanent flood control structures will require ongoing maintenance, including maintenance of access roads, fences, and other infrastructure associated with flood control facilities. The impacts to habitat and the cost of 50-years of operations and maintenance were not considered in the cost-benefit analysis in the 2004 Feasibility Study. The area upstream of Matilija Dam is the primary restoration site in the Matilija Dam Ecosystem Restoration Project, and the ultimate success of the project hinges on how this reach of Matilija Creek is restored and managed. 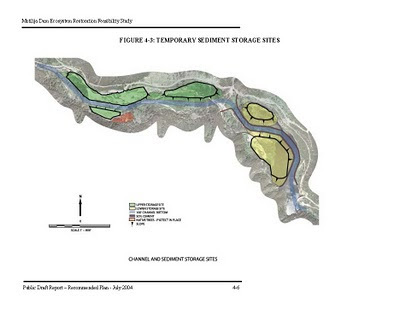 In general, the proposed upstream USA storage sites do not reflect the considerations that led to the conceptual design for upstream sediment management described in the 2004 Feasibility Report. The Feasibility Plan specifies temporary sediment storage areas that were carefully selected to minimize impacts to the existing habitat and provide for the restoration of a naturally meandering stream channel upstream of the current dam site capable of shifting its course in response to flow and sediment transport. This initially restored channel was intended to provide a starting point to provide for the natural evolution of the river within Matilija canyon following dam removal. Constricting this channel between permanent flood control structures protecting the permanent USA storage sites and Matilija Road in this reach of Matilija Creek will compromise this process, which is key to the ecosystem restoration objectives. The proposal is also inconsistent with re-establishing recreational opportunities within the restored Matilija Reservoir site. The Matilija Coalition remains committed to the removal of Matilija Dam in the most cost effective manner that will attain the Matilija Dam Ecosystem Restoration objectives. We support analysis of restoration alternatives that are consistent with the consensus plan outlined in the 2004 Matilija Dam Ecosystem Restoration Feasibility Study. We also encourage COE and County project managers to re-engage the scientific and technical expertise that initially contributed to the planning process. Experts in the fields of river and habitat restoration, fluvial processes, and fisheries restoration, as well as the resource agencies responsible for the outcome of this project, should all be active participants in this process. We look forward to moving this project forward in a positive manner toward an outcome that satisfies the concerns of all stakeholders and is consistent with the consensus plan approved in the 2004 Feasibility Study.